Will Sundquist of Rootstock recommends rosés on a hot summer day. Photo by Michael Cabana. Summer is coming. That may not sound as ominous as winter, but here in breezy Northern California the number of wine options can sometimes leave non-sommeliers in a state of paralysis by analysis. In steps Will Sundquist, wine director for Rootstock Wine Bar. A Los Gatos institution for six years running in Los Gatos, the celebrated wine bar and restaurant expanded operations a little less than a year ago to the bustling Vallco Shopping Mall in Cupertino. On a hot summer day, Sundquist recommends a rosé for the “perfect marriage of white and red” to avoid anything overly sweet. Rootstock has plenty of competition, as the public’s palate has elevated while prices for quality wine have dropped, but a top-flight wine club, comfortable outdoor seating and a selection of addictive flatbreads keeps ’em coming. 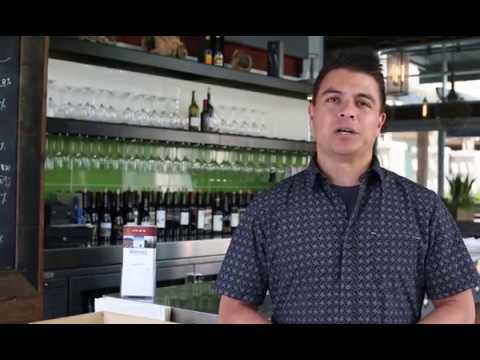 Check out SanJose.com on June 8 for a video featuring Rootstock wine director Will Sundquist’s tips to drinking well this summer. 19389 Stevens Creek Blvd, Cupertino. 217 N Santa Cruz Ave, Los Gatos. 20twenty cheese bar keeps it even with 20 wines and 20 beers, but the rotating cheese and charcuterie menu keep it especially eclectic, along with the fan-favorite truffle oil popcorn. The space is fresh and dog friendly in the heart of Willow Glen. Of all the reasons to love Cin-Cin—and there are plenty, as it won 2017 Best Of awards for happy hour and wine bar—this lively joint offers 50 percent off all bottles on Mondays. More than just a wine bar, Enoteca La Storia touts a robust menu while also playing host to nine different wine clubs. Regular wine tastings are held and members can attend monthly pickup parties. “One cannot think well, love well, sleep well, if one has not dined well,” Virginia Woolf said. And what is dining well without the perfect drink to complement the flavors on your plate? Noah’s menu is a wine-pairing paradise with excellent steaks, four-cheese fondue and seafood pastas. This three-time winner of the San Francisco Chronicle’s “Best Wine Classes in the SF Bay Area” will enlighten taste buds and teach aspiring connoisseurs as well as everyday newbs everything they need to know. Consistently noted as the top fine dining experience in Santa Clara, Parcel 104’s award-winning chef Bradley Ogden pays tribute to farm-to-table fresh American fare. Check out Friday’s Farmers Market Dinners, which are accompanied by Parcel’s selection of rare wine flights. Paint, laugh and nibble on crafty Italian cuisine while sipping quality vino. At Tessora’s, customers get the wine bar and bistro experience as well as comedy shows, game nights and live music on the weekend. Aficionados and novices alike will appreciate this cozy retreat, which feels more like a friendly neighbor’s living room—assuming that neighbor is a sommelier—than an actual wine bar. Conveniently situated in Santana Row’s open-air marketplace, Vintage offers reprieve from shopping to relax and watch people while sipping premium wines. We recommend the “Fun and Flirty Flight of Wine” sampler. This is a bastion for those interested in tasting different local wines without using a spitoon. The bar has more than dozen wines on tap, and a list of 30 bottled wines from the greater Bay Area to choose from. No snobbery here, just good wine. This European-style wine bar specializes in small production boutique California wines, mirroring its name with world-class wines from Santa Clara County and the Santa Cruz Mountains. Nestling guests in dim tones of red and black, this modern wine bistro offers an irresistible happy hour menu of $5 house sparkling, smoky Argentinian Malbec, Sweet and Sour Citrus Mojitos and more. It’s not uncommon here to end up conversing with a San Jose State professor while enjoying a glass. Ancient Romans often said: “The necessary ingredients of civilization are wine and olive oil.” It stands to reason that We Olive recognizes the benefits of pairing these age-old accomplices. The menu features some excellent California Cabernets and less common varietals like Trousseau Gris. Wine Affairs attracts a bit younger crowd thanks to their 50 wines, 40 craft beers and wide array of tapas. The bar is also home to three different wine and beer clubs and the happy hour is a legitimate deal.